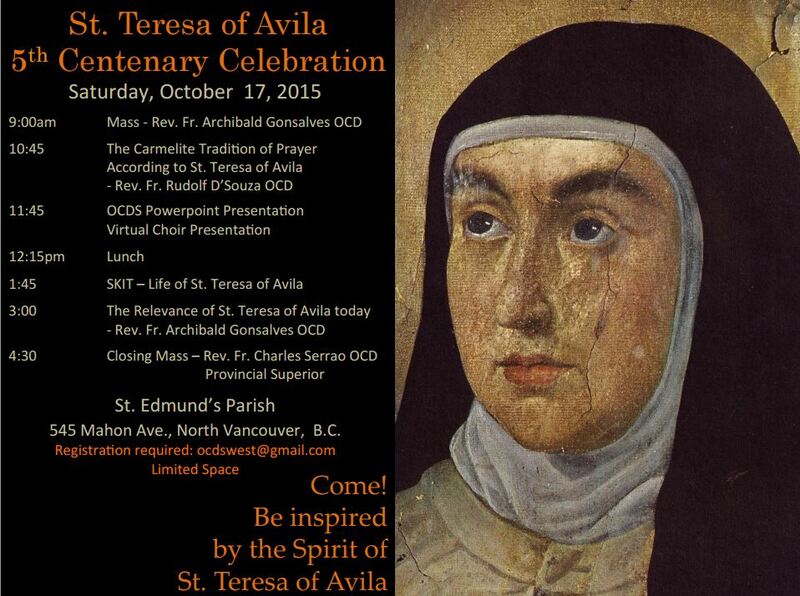 ST. TERESA OF AVILA 5th CENTENARY CELEBRATION – Saturday, October 17th, at St. Edmund’s Parish on Mahon Avenue, North Vancouver. Event starts with a 9:00 am Mass (main celebrant Rev. Fr. Archibald Gonzalves, OCD) followed by presentation in parish hall then ending with Mass @4:30pm (main celebrant: Rev. Fr. Charles Serrao, OCD, Provincial Superior). See below for full details. Limited space – registration required – ocdswest@gmail.com Come! Be inspired by the Spirit of St. Teresa of Avila.